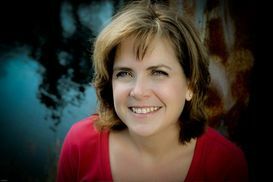 It's my pleasure to introduce historical author Genevieve Graham to The Romance Dish today. 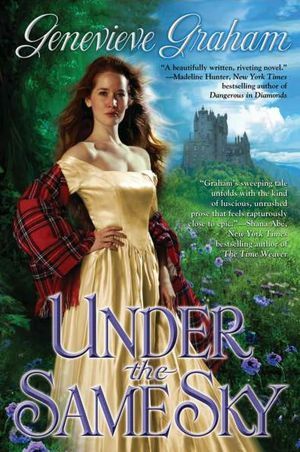 A graduate of the University of Toronto with a degree in music performance, Genevieve now lives in Nova Scotia where she splits her time between 18th century characters and her 21st century husband and daughters. She's here today to blog about her debut novel, Under the Same Sky. Welcome, Genevieve! Once upon a time I sent my little princesses off to elementary school on the big yellow carriage, kissed my Prince Charming, and headed into the basement. Fortunately, all the cinders had already been emptied, the mending finished, and the little cartoon birdies had finished singing on my shoulders. So, enjoying a rare moment without chores, I sat at our one and only desktop computer and stared at the screen, waiting for magic. When it came, spinning from my brain onto the screen in living, breathing, technicolour adventures, I was amazed. “Under the Same Sky” was the first thing I’d ever written, and I’d done it just for fun. In my mind I was introduced to Maggie, and she showed me her life, as miserable and strange as it was. The next day I was thrown into a bloody battle scene in Culloden Moor in 1746. I helped Maggie reach out and bring both hope and strength to the man she’d dreamed of all her life. No shining armour in this story, no castles, no pumpkins. But adventure? Love? Hope? Oh yes. Since I had so much practice working hard at scrubbing floors and making little outfits for talking mice, I had no trouble working hard on the book, researching, editing, learning what “real” authors did. When I showed the completed book to my family and friends, they seemed to like it (though they’re kind of obliged to at least say that). Why stop there? I started querying agents. That’s when I almost gave up. Everyone else seemed to be going to the ball, getting published, seeing their books in stores. But rejection after rejection kept arriving in my email. Then, just when I feared all was lost, my fairy godfather appeared, in the form of my wonderful agent, Jacques de Spoelberch. With a wave of his magical pen he made the impossible possible: Penguin bought not only my first book, but my second as well. So it’s only fitting that my book revolves around dreams as well. When I sign books, I add “Believe in dreams” to my name, because sometimes they actually come true. SERIOUS note: I should probably warn you here: “Under the Same Sky” is not a romance like mine was. Despite the beautiful cover, my story is not what it seems. I can’t write light romances, nor can I write predictable ones. My stories are dark and often difficult, dealing with real life tragedies and experiences people had to survive. Especially back in the 18th century. When you wish upon a star, sometimes Fate will see you though. Sometimes, though, she’s busy with someone else’s miracles and you’ll have to make them happen yourself. “Under the Same Sky” is just a little bit different that way, though. Since the couple can communicate through dreams, they get a little more assistance from each other along the way. Knowing you might someday pick up my book and read it is my dream. Seeing my own guest blog on this terrific sight is something I never dreamed of. So believe in your dreams. You never know what might come of them. I’m loving my Happily Ever After! This sounds like a terrific plot line; I love a touch of the paranormal in my romances. Or in this case it sounds more like a spiritual connection through the dreams of the protagonists. You've got me quite interested! I do believe in dreams and the things they can sometimes teach us. I have had some personal experience with them as well. UNDER THE SAME SKY looks like such a wonderful read. This sound like a different story. Is there no HEA? Thank you, ladies! Yes, Dianna, there's a happy ending. But both characters come through some very rough times in order to reach it. While the story is rich with colour and characters, readers need to know that the 18th century was a tough time for everyone—especially women—and I didn't pull any punches when it came to violence. It's not gratuitous, but it's what happened. I agree, it was a terrible time for everyone especially women. I am anxious to read it. Glad to hear there is a HEA. Genevieve, I read your book UNDER THE SAME SKY as a GoodReads 1st read and absolutely LOVED it. I have your second book on order and I'm really looking forward to reading it. Please - keep them coming!! Thanks for stopping by Betty and for telling us how much you enjoyed UNDER THE SAME SKY. Good Morning, Genevieve and welcome! I haven't read UNDER THE SAME SKY yet but I just finished your second book, SOUND OF THE HEART and enjoyed it. Readers, watch for my review of SOUND OF THE HEART as well as a short Q&A with Genevieve coming up May 3. Looking forward to your review and the Q and A. Don't work too hard today! Genevieve, it's so nice to hear that you are writing about real life. Sometimes, romance novels tend to simply pick up where the last one left off. While it's nice to escape reality in a book, it's equally as nice to read something to which one can relate and make us pause, think about and digest what we just read. I have not read any of your novels yet, but that will soon change. I'm quite intrigued and look forward to reading them. I had to smile at the way you began your blog. It sounds as though keeping your sense of humor helped to keep you focused on succeeding. Congratulations! Well said Connie! There is a time for each kind of romance story. Congrats!!! I'm looking forward to reading your latest!! Welcome to The Romance Dish Genevieve. We are so happy to have you with us. I live your post!!! Dreams do come true. And yes it takes hard work. Congrats to you on achieving your dreams. Looking forward to your Q and A next week. Congratulations. Dreams are something everyone should have. To be able to make/have them come true is wonderful. I like the sound of UNDER THE SAME SKY. Life is too often not easy. History as well as current events shows us that. Romance stories sometimes skim over the difficult parts of life. I think that a romance that manages to survive and flourish in spite of the difficulties the couple is dealing with is all the more impressive and fulfilling. Highland stories were the first romances I read and are still my favorites. What happened in Scotland during the 18th century is heartbreaking and infuriating. The same cold hearted, calculated destruction of a culture and people was repeated in Ireland not much later. Bring these elements into a story give it a soul as well as a heart. I added UNDER THE SAME SKY to my Wish List after reading the first article about it. I look forward to reading it. Best of luck in your writing career. I'll be looking for more books with heart and soul.